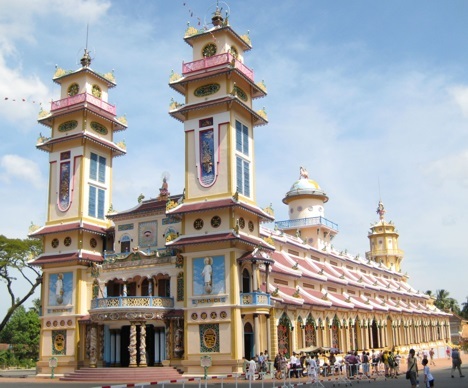 Caodaism Beliefs - What are the beliefs of the Cao Dai religion? Caodaism is a syncretistic religion that combines aspects of many religions, especially Confucianism, Buddhism, and Catholicism. Caodaists are proud of syncretistic nature of their religion, since they believe that if studied closely enough that the same underlying principles are beneath each religion. Moreover Cao Dai is seen as noble effort to unite humanity and create a more tolerant world, recognizing all of humanity as being all brothers and sisters from the same divine source. The Supreme Being in Caodaism is known as Cao Dai (literal translation: "High Tower" referring to the spiritual place from which God reigns). Caodaists believe that Cao Dai is the same Supreme Being that is part of all the other major world religions, but avoid labelling God with earthly attributes such as gender or personality. 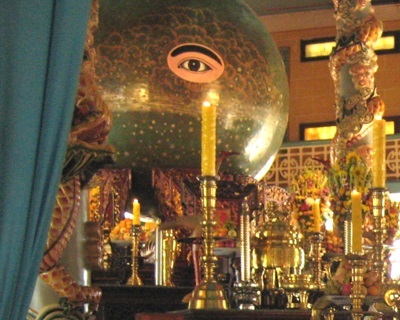 Cao Dai is represneted by the Divine eye, an image of a left eye in a triangle. This image appears on Caodaist temples and in Caodaists homes. The left eye is used, because God is Yang, and Yang is the left side. Caodaists recognize many historical and religious figures as saints inclouding Buddha, Confucius, Joan of Arc, Julius Caesar, Muhammed, Pericles, Sun Yat-sen, and Victor Hugo. Both saints and ancestors are honored at Caodaist temples. Like Buddhists, Caodaists believe in cycle of death and rebirth. Those who acquire too much bad karma during their lives may be reborn into negative circumstances. During life Caodaists seek to avoid bad karma and gain religious merit. The goal is to eventually achieve salvation (nirvana) by achieving freedom from the cycle of death and rebirth.